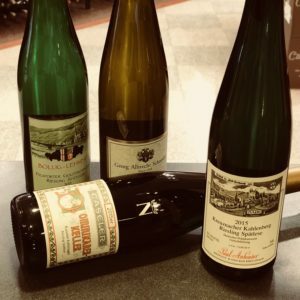 A Night of German Wines to Remember at Colonial Spirits! Colonial Spirits Loves Bringing the Best Wines to You! We will be pouring some special German wines this coming Friday, March 2nd from 4-7 p.m. Yes, there will be a few Riesling (in varying levels of residual sugar) but we will also have at least one other varietal, Scheurebe, a cross between Silvaner and Riesling, that produces exceptionally interesting white wines. Producers include Bollig-Lehnert, Paul Anheuser, C. Von Nell-Breuning, and Georg Albrecht Schneider from the Nahe, Mosel and Rheinhessen regions. If you are a true oenophile, you need to stop by and try these wines on Friday! If you want to read more about this event, click here!